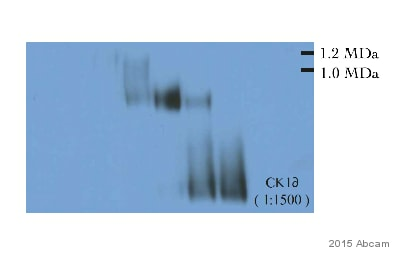 Recombinant full length protein (His-tag) corresponding to Human Casein Kinase 1 delta/CSNK1D aa 1-415. Purified from E.coli. HeLa, K562, SK-N-MC, 293T and L929 cell lysates. This antibody also gave a positive signal in Human Alzheimer brain (hippocampus) tissue section. This product was changed from ascites to tissue culture supernatant on 18th September 2017. Lot numbers higher than GR155202 will be from tissue culture supernatant. Please note that the dilutions may need to be adjusted accordingly. Previously labelled as Casein Kinase 1 delta. Our Abpromise guarantee covers the use of ab85320 in the following tested applications. WB Use a concentration of 0.05 µg/ml. Detects a band of approximately 47 kDa (predicted molecular weight: 47 kDa). Casein kinases are operationally defined by their preferential utilization of acidic proteins such as caseins as substrates. It can phosphorylate a large number of proteins. Participates in Wnt signaling. Central component of the circadian clock. May act as a negative regulator of circadian rhythmicity by phosphorylating PER1 and PER2. Retains PER1 in the cytoplasm. Expressed in all tissues examined, including brain, heart, lung, liver, pancreas, kidney, placenta and skeletal muscle. In blood, highly expressed in hemopoietic cells and mature granulocytes. Also found in monocytes and lymphocytes. Defects in CSNK1D are a cause of familial advanced sleep-phase syndrome (FASPS) [MIM:604348]. FASPS is characterized by very early sleep onset and offset. Individuals are 'morning larks' with a 4 hours advance of the sleep, temperature and melatonin rhythms. Belongs to the protein kinase superfamily. CK1 Ser/Thr protein kinase family. Casein kinase I subfamily. Overlay histogram showing HeLa cells stained with ab85320 (red line). The cells were fixed with 80% methanol (5 min) and then permeabilized with 0.1% PBS-Tween for 20 min. The cells were then incubated in 1x PBS / 10% normal goat serum / 0.3M glycine to block non-specific protein-protein interactions followed by the antibody (ab85320, 1µg/1x106 cells) for 30 min at 22ºC. The secondary antibody used was DyLight® 488 goat anti-mouse IgG (H+L) (ab96879) at 1/500 dilution for 30 min at 22ºC. Isotype control antibody (black line) was mouse IgG2b [PLPV219] (ab91366, 2µg/1x106 cells) used under the same conditions. Acquisition of >5,000 events was performed. This antibody gave a positive signal in HeLa cells fixed with 4% paraformaldehyde (10 min)/permeabilized with 0.1% PBS-Tween for 20 min used under the same conditions. IHC image of ab85320 staining in human Alzheimer brain (hippocampus) formalin fixed paraffin embedded tissue section, performed on a Leica BondTM system using the standard protocol F. The section was pre-treated using heat mediated antigen retrieval with sodium citrate buffer (pH6, epitope retrieval solution 1) for 20 mins. The section was then incubated with ab85320, 0.2µg/ml, for 15 mins at room temperature and detected using an HRP conjugated compact polymer system. DAB was used as the chromogen. The section was then counterstained with haematoxylin and mounted with DPX. Casein Kinase 1 delta/CSNK1D was immunoprecipitated using 0.5mg Hela whole cell extract, 5µg of Mouse monoclonal to Casein Kinase 1 delta / CSNK1D and 50µl of protein G magnetic beads (+). No antibody was added to the control (-). Proteins were eluted by addition of 40µl SDS loading buffer and incubated for 10min at 70oC; 10µl of each sample was separated on a SDS PAGE gel, transferred to a nitrocellulose membrane, blocked with 5% BSA and probed with ab85320. Band: 47kDa: Casein Kinase 1 delta/CSNK1D; non specific - 40kDa: We are unsure as to the identity of this extra band.